Hey lovelies. So if you know me, you'll know I'm very into exercise and nutrition but there's something about protein powders that always scared me a bit! Even though I've heard they're great for exercise and workouts, I'd see the words 'meal-replacements' and 'muscle gain' online and panic, and I guess it's just that feeling of not knowing what's in these powders that used to put me off. However when the brand Purition* very kindly sent me over their Discovery Box, filled with 6 different Vegan flavours to try, I decided to give them a go. 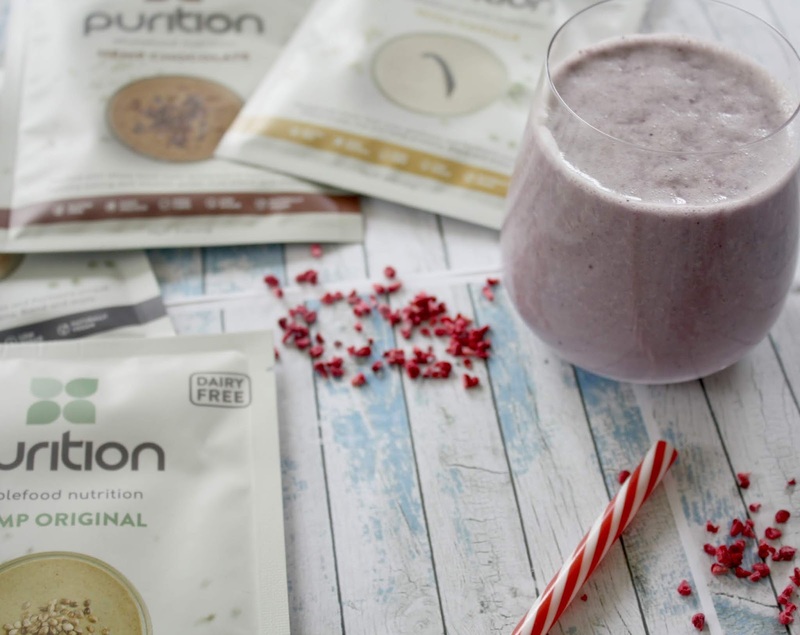 Purition is a 100% natural brand and unlike most Protein Powders theirs are made mainly from hemp protein and not filled with any of those powdered milk, sugars and chemical nasties like lots of 'health drinks' out there. 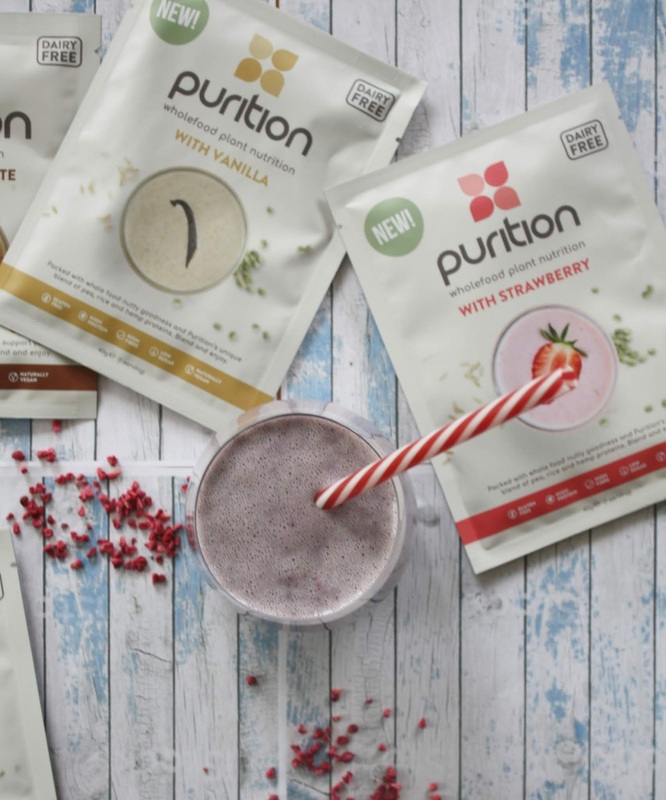 As a complete newbie to Protein Powders, here's my honest review on these Purition Powders. From how they blend, to how they taste and whether they're actually worth the fitness hype, I hope you enjoy! A Discovery Box like this costs £12.99, also coming with free UK delivery and is the perfect way to try out a brand without diving straight in with a large 500g Bag. The first thing I checked was the ingredients list on the back and I was pleasantly surprised to see a super short list. 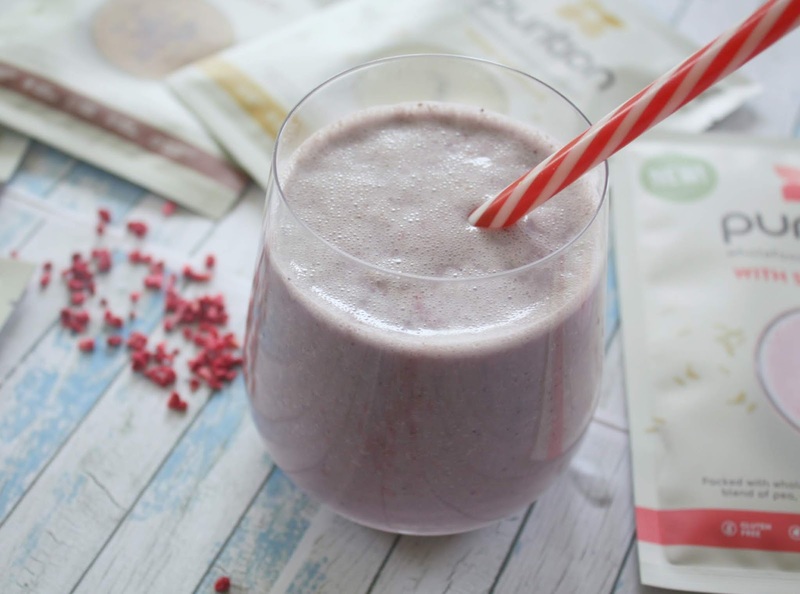 The shake is full of genuine ingredients, free from cheap fillers, artificial flavouring (and those kinds of ingredients you can't even pronounce!) So this 100% put me more at ease when trying them out. The instructions that came with the shakes was that they should be blended up with a milk of your choice (for me I used almond milk) and then enjoyed as a breakfast or pre/post workout snack. It also notes that if left for a few hours the shake with actually become like a porridge thanks to all the fibre which I found really interesting and I'll definitely be trying that next. If you're used to normal protein shakes, the texture and flavour of these may come as a bit of a surprise to you. Once blended, all the hemp protein and fibre left my shake with a naturally unsmooth and 'bitty' texture which I wasn't sure of at first but looking back I now think of it as more of a good thing. If you can dissolve something completely then I guess it only shows there's not a whole lot of natural goodness in there and instead it's mainly with artificial ingredients! As for the flavour I tried in this post (Blackcurrant) I loved the gorgeous purple colour of it once blended, and you can see me pouring it out above. This was the first Powder I tried and although I can't fault it, I'm one of those people who just gets bored of a standard vanilla flavour. Instead, I ended up mixing mine with other ingredients in a blender like banana, cacoa powder and oats and it made for a deliciously creamy post-workout smoothie. 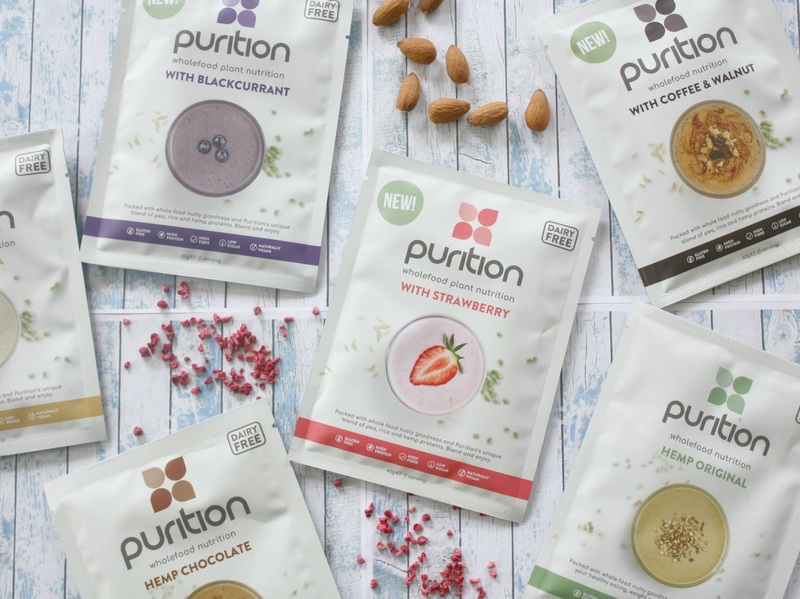 If you're looking to try out just one of these flavours from Purition, this is definitely the one I'd recommend most! Rich, chocolatey and packed with goodness, this was delicious and while I used it simply in a shake, it would even be great for incorporating into healthy baking recipes and other food. I'm a huge chocolate lover so it's no surprise this was a hit. Despite the bright purple colour of it which got me so excited at first, I wasn't as big a fan of this flavour. For a subtle taste it's lovely, but in the morning I'm always craving a burst of sweetness or berries and this just wasn't strong enough for me and I ended up giving it to my mum. Next time I'd probably add the powder to a smoothie bowl with frozen berries and banana for a creamier taste. This is a flavour you'll always see as a Protein Powder staple and if I'm honest I've always thought it tastes super artificial and sickly in any food (yep, that includes ice-cream!) but I actually loved this. Sweet, light and delicious when mixed with oats and yogurt which I had for breakfast one day. If you're used to normal commercial protein powders, the flavour may come across a lot more subtle but it was perfect for me. This was my least favourite of the flavours, but only because (as you can imagine) it was the most basic of powders and so didn't taste of anything. Disguised in protein pancakes, a baking recipe or smoothie bowl it would be a great way to up your protein for the day, but by itself I can't say I was much of a fan. Mmm this tasted as good as it sounds! A Coffee and Walnut shake for breakfast was the perfect autumnal drink and if you're an ice-coffee lover I'd say this definitely reminded me of that. Would love to buy a full 500g bag of this in the future. 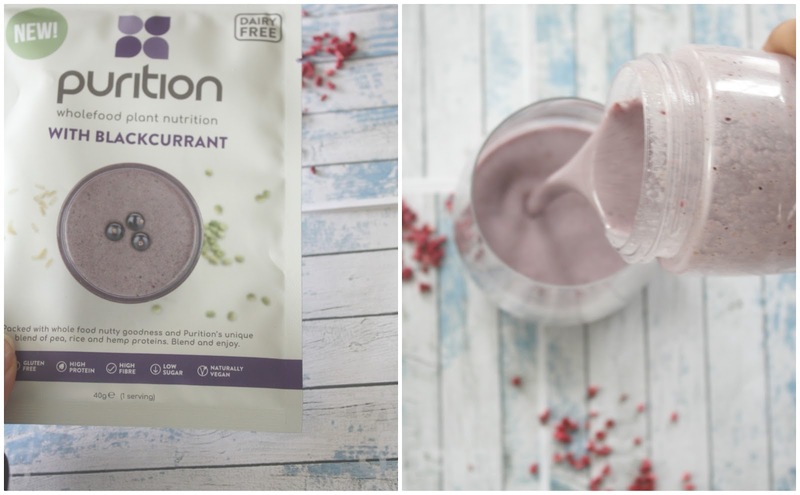 Overall I loved trying out the Purition Natural Protein Powders, and knowing they were all-natural made it all the better. If you're used to normal commercial protein powders they make take some getting used to, the bitty texture wasn't my favourite but I loved the more subtle taste of the protein shakes compared to those that are overly creamy and sickly-sweet. After trying these out I also can't wait to incorporate Protein powders into my weekly recipes like overnight-oats, pancakes.or imagine brownies with that delicious 'Hemp Chocolate' flavour...mmm! To view the full range on the Purition website feel free to click here (I'm pretty sure they now have a Pumpkin-Spice range out now for autumn!) and I hope you enjoyed this review. Let me know in the comments if you've ever tried Purition Protein Powders or any Protein Powders for that matter, and what you thought of them? QOTD: WHAT FLAVOUR POWDER WOULD YOUb MOST LIKE TO TRY? I'd love to try the strawberry flavour! I love protein powders. I make a protein drink after my workout. I would love to try the black currant and coffee and walnut. The flavors sound wonderful to me. Hemp chocolate also peaked my curiosity. I've never tried protein powders but I really want too, I've heard they can do so much goood for you, Personally I always opt for a strawberry milkshake so that sounds best to me!. I've seen that they've got some vegan ones, so I might try them! Love that these protein powders are individually packaged. It's so much easier to carry around than those protein powder jugs, hehe. Pretty cool that there are so many different flavors! I know I'd love the coffee and walnut one. Thanks for sharing! Sounds pretty good, I haven’t tried a new protein powder in a while.